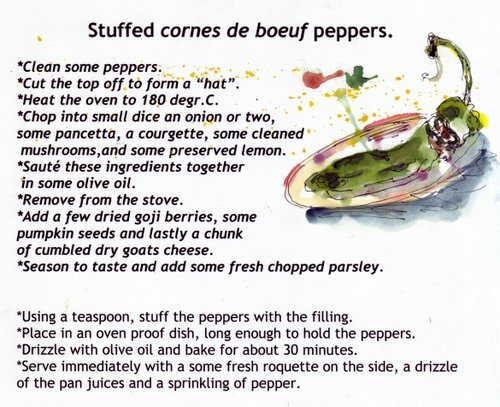 Stuffed cornes de boeuf peppers and a book on food and painting. These cornes de boeuf peppers from Spain lend themselves ideally to stuffing and they are fascinating with their long and twisted shapes. 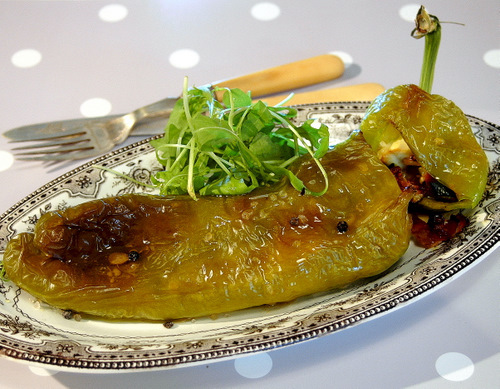 Ordinary sweet peppers or courgettes can be used instead of the peppers. Or more piquant peppers. Can be served as a starter or a vegetable accompaniment, or even a whole meal served on a green salad with a mustard vinaigerette. When stuffed tightly with a crumbs filling, it can be sliced and served as an aperitif on canapés, with a moelleux wine, (a sweet, fruity white wine). In Octobre I had an art friend visiting France and she stopped through here in Touraine, where we met for the first time after being blogging friends for a long time. See both her sites, Making a mark(in which she covers much more information than just art – her latest post is about Technorati and blogosphere…have a look) Travels with a sketchbook is all about her sketching and travelling. Katherine and her sister and niece had dinner with us at home on their last night here and they brought me a beautiful book – Boire et manger that I wish to share with everybody. It is such an inspiration, seeing how food and art have walked hand in hand through all ages, depicting the habits and cultures and changes of the times and the different symbolisms of different foods, some of which we still hang onto today; cherries being a symbol of love and volptuousness, bread being the symbol of the body of christ, the apple seen as the origin of sin. I wish I could share the whole book with you, but here are a few excerpts. I hope they delight you as much as they did me and inspire you to be creative with food, not that I mean to paint it, but to “paint with it”! And above all, to respect it! 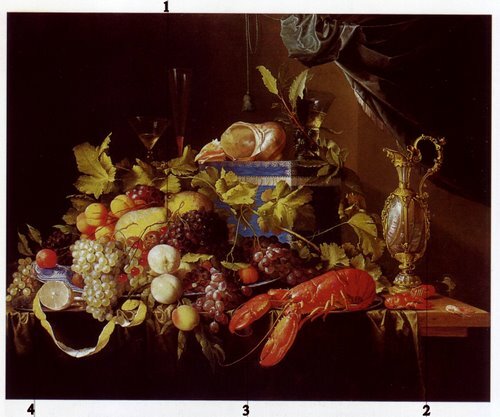 You can see more examples on Africantapestry at Food sketches and a book on dining a painting. Le melon-meaning: Sweetness, earrthly pleasure, friendship. 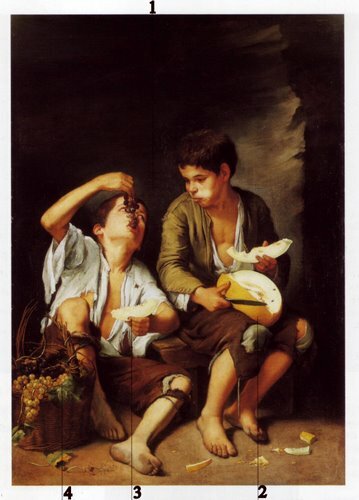 Maybe look between the two boys could be interpreted as a silent dialogue between them to decide which fruit they prefer; the grapes or the melon, both having existentially different symbols. In the mythical sense the melon symbolically represents the earthly sweetness and pleasures of the flesh. the melon is always not only the cosen sweet ness of both adults and children, but a symbol of friendship, because the quality of the kin of the melon can determine the quality on its flesh. Grapes, givng birth to wine, could be reference to the spiritual path and the need to follow it. Olive and oil – meaning: Grace of the Holy Ghost, conscience, clemency and charity. The European porcelain soupterine accentuates the refinement of the table. Two coilcans are presnt- one for oil and one for vingar, the usage of both these condiments togheter would be reaffirmed during the ages. The rustic terrine had a specific culinary function, which was the making of paté and was typically French cuisine. This still life present a contrast between elegance and rustic in the display of the kitchen tools and refined tableware. 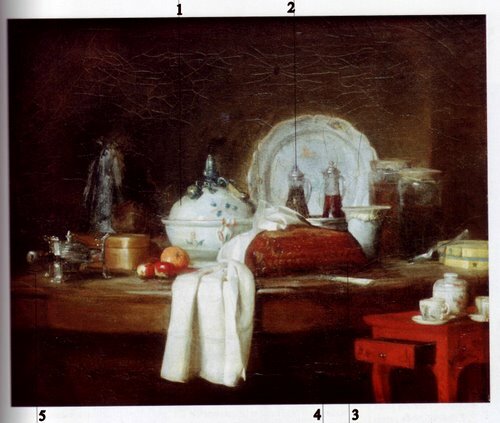 Chardin was fascinated by the culinary arts and gastronomy and used both at the same time to create his art. The silver warmer with silver seen as a noble metal, was part of the refined table and added to the elgance of the piece. The fruit represent the earthly pleasures and in deeper context they represent the joy of the spirit/mood. The ornate decoration on this pure precious metal container represents its excellence and gives it a symol of saintly spirituality. The lobster is a symbol of resurrection. The peeled lemon represents life; which gradually “peels” off the outer earthly layers to finally arrive at the soul. the borken windeow represent the negligence of this humble environnement. 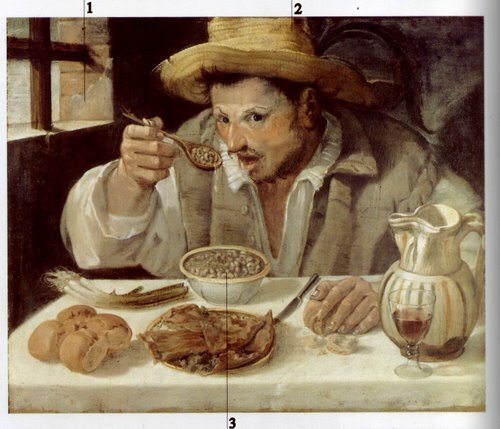 The man eating the beans was a subject reintroduced to painting at beginning of the XVI century. Up until then this theme was only kept to the indignant. The dried bean was condidered the most humle of the starch food and and represents the everyday food of the common peasant. Cutlery- menaing: Elegance, finesse, treason, word of God. The presence of the cauldron emphasizes the popular character of the represented scene. 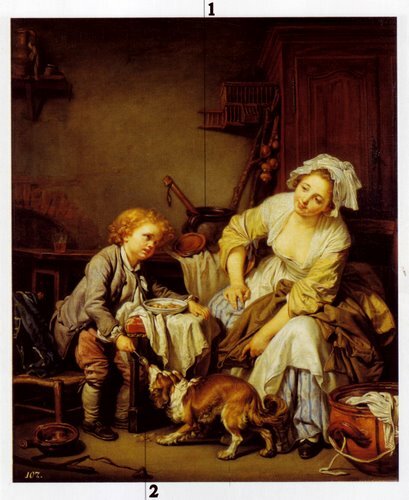 The little boy holds a silve spoon, which contrasts with the humble and diorganized environnement. During this era, a silver spoon was given to children, because silver was believed to have antibiotic properties. Previous Article Pears in red wine and a wine harvest. This post is awsome just like the pepper recipe! You are uniquely charming to me. I am off to see the links..The art from the book is beautiful of course and for some reason reminds me of my mother.. her way of painting was quite old world..I will show you one day..You must have had such a nice time !So much in common.. Thank you for the recipe..It looks so flavorful..peppers impart a wonderful taste to food.. both raw and cooked…Tell us.. are your watercolors small size? Large? Index card size? Je suis curieuse..C’est si joli. Your peppers look lovely! The preserved lemon sounds fantastic in these. I can imagine how you must have drunk in every bit of information from that book!! What a lovely post this is!! I just popped in to your post on my way to work.The recipe on peppers look delicious. I am going to try it out. What an awesome book. I will google it later today. Thanks again for your inspiration. Ronell, ek geniet jou en Cecily se “bloggs” so baie. I really enjoy the art combined with your tasty recipes. What a lovely blog. I am endeared to your approach to life and food. I think my dad in law has this book 🙂 really great for gourmet and art lovers!! 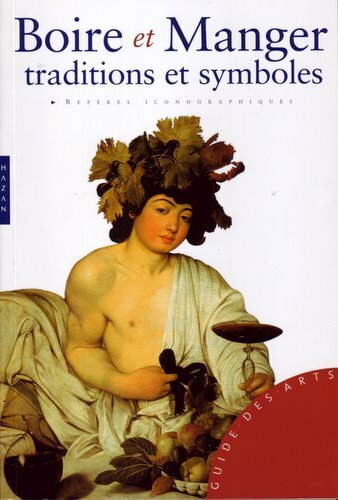 This is an excellent book for food and art lovers like us!! and that stuffed pepper really worth trying 🙂 gotta find corne de boeuf peppers in the market! Oh my…….I’m becoming a major fan of this blog… You tease us with a recipe for stuffed peppers and then bring on the entree of stunning photos of mouth-watering paintings. As someone who majored in art in college and who now uses food as one of my mediums, I’ll be back often. Thank you, thank you, thank you! I’ve never seen this. So unique and delicious. The stuffed peppers look divine!